Recently, a group of Redcoats wondered aloud…”Can we name the Band Practice Moms the section of the week?” After some discussion, the group concluded that this dedicated group of parents was worthy of more wide-spread acknowledgement, so, we are proud to present this volunteer spotlight as the first nomination from the practice field! 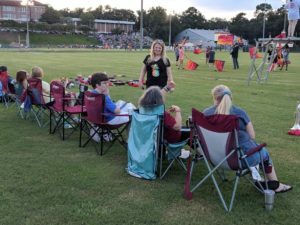 At a practice last week, no less than 10 Band Moms were spotted on the field, ready for action. When asked what makes these parents so special, the Redcoat response was unanimous: “they do everything.” At any given moment you can find them in stretch block, showing rookies the back hash, distributing water, tending and mending instruments and Redcoats, offering encouragement and advice, problem-solving, guarding piles of student stuff, delivering popsicles to over a hundred kids (an amazing effort to watch), and whatever else needs doing. We would like to give a big shout-out to all of our Band Practice Parents (Dads, too!) and supporters who help our Redcoats prepare for greatness. The Redcoat family appreciates you! And, maybe best of all, the kids think you’re awesome. Huge thank you to all of the Parents who help support the band in all capacities! !